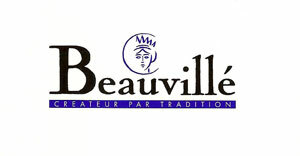 Beauvillé – Located on the Alsatian wine road in the picturesque town of Ribeauville, the company specializes in high quality screen printed table linens and tea towels. Their designs range from typical Alsatian scenes to grand designs inspired by French and German culture. This region has been part of France since World War One, but was part of the German empire in the late 1800’s and an independent Duchy prior to the Napoleonic era. Linens are designed by award winning artists and made of the finest satin cotton. Tea towels are cotton and linen and suitable for framing, as well as kitchen duties. Dyes used in the printing process are of highest quality and hold their color through a lifetime of washings. A full line of table cloths, napkins, runners, and placemats are available. Garnier Thiebaut – The resort city Gerardmer in the Vosges mountains of Eastern France is home for several linen manufacturers. Garnier Thiebaut dates back to the early 1800’s and invention of the jacquard weaving process. For many years they specialized in linens for restaurants, and still manufacture custom linens for some of the most prestigious hotels and restaurants in the world. Several years ago they branched out into household linens, including table linens, kitchen linens, and bed linens. By hiring creative designers, and employing computer assisted design and manufacturing, they have developed a line of premium woven linens employing whimsical and complex designs. In addition to the Garnier Thiebaut brand, they produce Robert le Heros brand in a more modern design, and Heritage 1833 traditional design reversible cloths. They have popularized teflon coated spill resistant and wipeable linens available in many styles. A full line of table linens is available. Vent du Sud – Provencal traditional style printed and woven table linens are poduced by Arguel SA in Maugiuo in the South of France. They produce rounds, squares and rectangle tablecloths in coated and uncoated cotton. Matching napkins are available for most styles. Valdrome – Located in the Provencal city of Valence, Valdrome has been producing Provencal style linens and accessories since the 1700s. The printing technique was brought to Europe from India in the mid 1700s by French explorer Jean de Valdrome. They specialize in quilted placemats. Valdrome left the market in 2008 due to financial problems. Under new ownership, Valdrome has returned to the market with their traditional Provencal designs, available by special quotation. Couleur Nature features highly colorful Provencal designs which are hand block printed in India from French designs . While traveling through Rajasthan, India, Paris based designer Bruno Lamy was introduced to the age-old technique of hand-block printing, an art form passed down from generation to generation. Impressed and inspired by the unique beauty of hand-made textiles using this technique, Mr. Lamy returned to Paris and began creating a visually enticing array of Provencal-inspired linens that has become known as Couleur Nature. Sold throughout Europe and North American, Couleur Nature has quickly become a household must for the sophisticated consumer. Couleur Nature table linens are offered in a vibrant assortment of designs and sizes that suit a wide-range of personal styles and occasions. The versatility of our designs allows the linens to be used on formal or casual table settings year-round and are suitable for everyday use. Mr. Lamy has been designing textiles for over two decades and is continually inspired by the response of the U.S. consumer. As a result of the high demand and admiration for these linens, two new prints are introduced each season in various colour ways and are interchangeable with previously introduced patterns.